SAN FRANCISCO — Boomtowns: How Photography Shaped Los Angeles and San Francisco begins with an anonymous 1851 daguerreotype panorama of San Francisco and closes with a 1949 gelatin silver print by Minor White of houses on the city’s Baker Street. The exhibition, up through March 10 at San Francisco’s California Historical Society, documents how California (which became a state in 1850) and photography grew up together, and how photos influenced the rest of the country’s perception of the state’s two leading cities. The show draws from the Historical Society’s collection of half a million photos, and examines who cities are for and who makes decisions about them. Erin Garcia, the show’s curator, said that working in downtown San Francisco in the midst of a boom made her wonder about how cities evolve and who propels those changes. San Francisco boomed with the 1848 Gold Rush, going from about 1,000 residents in 1849 to 25,000 the following year. In Los Angeles, the explosion of growth didn’t happen until a couple of decades later when the railroads came in, and passenger lines, business interests, and developers aggressively promoted the city. Right away, San Francisco, with its steep hills, sweeping views, and the Pacific Ocean, was one of the most photographed places in the world. Many people who didn’t make their fortunes in the gold fields started businesses — including opening photography studios. Some of their customers were miners who wanted to send photos of themselves with their shovels, picks, and pans to their relatives. With the railroads established, Los Angeles was promoted as clean and healthy, with sunny weather and a mild climate. A photo from Sunset magazine is captioned: “Los Angeles, California, is noted for its miles of beautiful homes and garden-like streets.” The back of a postcard from the same magazine reads “California wants people like you.” Garcia notes that “people like you” referred to white people seeking to get away from the cold and crowded cities in the East, where immigrants had settled. The exhibition includes photos of San Francisco after the 1906 earthquake and fire that devastated the city — there is a photo of a refugee camp set up for those left homeless, as well as an aerial shot taken from a camera suspended from a kite, titled “San Francisco in Ruins.” You can also see the rebuilding of the city with a panoramic view of the Panama-Pacific International Exposition in 1915. Demographic shifts are noted, such as the Japanese Americans emptying out of the city during World War II, when they were interred in isolated camps, and African Americans moving into the Fillmore neighborhood that had previously been predominantly Japanese. White has a 1949 photo of this neighborhood, with a poster on the wall of a building advertising a skin bleaching cream. In Los Angeles, after the railroads came in, it took the city a while to figure out its infrastructure, but once it started growing, it grew explosively, presenting itself as a sort of a tropical oasis. 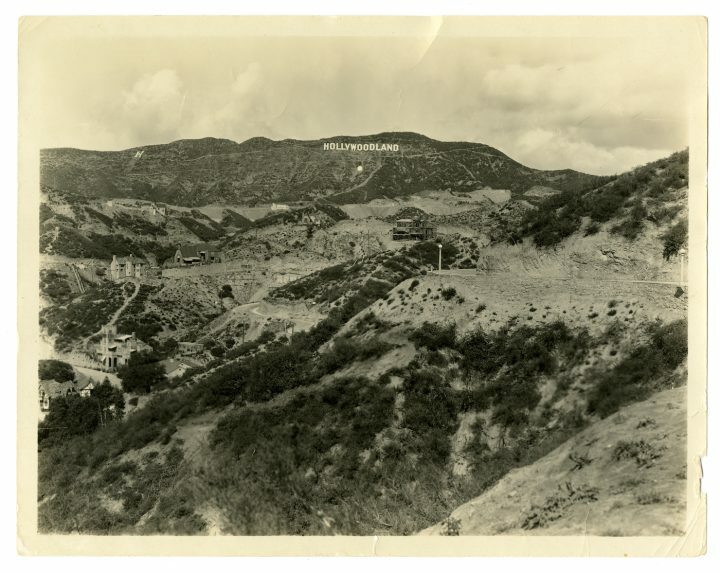 There are several photos of the 1920s housing development, Hollywoodland — where the city’s iconic sign came from. 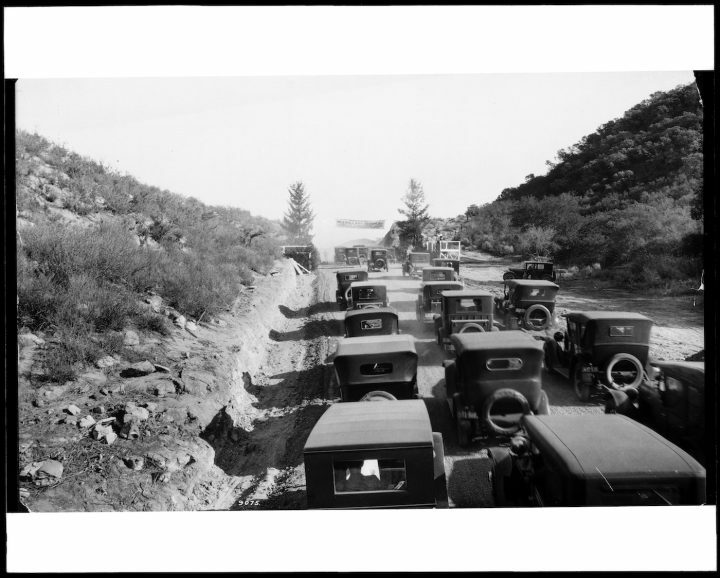 One photo shows LA’s early car culture: a traffic jam of Model A cars waiting for the opening of Mulholland Drive in 1924. There are very few people in these photos — almost all show buildings and neighborhoods, presenting a photographic history of two very different cities and how they grew. When these urban centers were developing, and covering land that had been open, the change was dramatic. One photo, again one of White’s, shows a new house right next to a sand dune in San Francisco’s Sunset district. Today that sand dune has been long covered by more houses. Change keeps coming, even as space to build shrinks. Boomtowns: How Photography Shaped Los Angeles and San Francisco continues at the California Historical Society (678 Mission St, San Francisco) through March 10.